For the past few weeks, environmental organizations and protestors have been sharing their concerns over testing being conducted by TransCanada in the Cacouna region. Fisheries and Oceans Canada says there's no need to worry about any impact on the belugas from the underwater work planned by Trans-Canada Pipeline near Cacouna. But marine mammal experts disagree. Robert Michaud from GREMM tells us why. 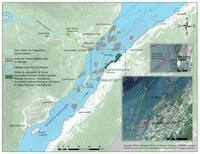 Image left, combines information from GREMM, Parks Canada, DFO and Environment Canada. Close-up can be seen here.